The Water District has been recognized by the Texas Association of School Boards for its support of education programs in San Patricio and Aransas Counties. 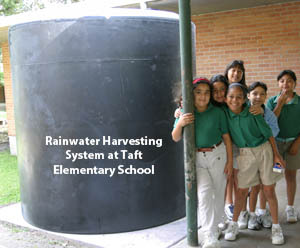 For many years the Water District conducts water conservation education programs in cooperation with public school teachers and supports other school programs. This includes providing thousands of school book covers that include water facts and conservation information. The District also works with municipal water departments in their community conservation and education programs which often involved students and classroom activities. The District uses bottles of drinking water as part of the ongoing conservation education effort. The water is bottled by District staff and labeled with a reminder to "Water Wisely" and the message that "Every Drop Counts." A limited number of these special bottles of water are provided to school programs and special events as part of the conservation education program. Ingleside School Superintendent Troy Mircovich nominated the San Patricio Municipal Water District for the Texas Association of School Boards (TASB) recognition. The group is conducting a statewide program encouraging individuals, organizations and companies to continue their support for public schools. TASB notes that "American public education is a unique human endeavor, developed over the years to serve the highest altruism: The desire to help all children in the community grow into their potentials, to equip them for production and joyous lives, and to ensure that they have the preparation to be admirable adults."